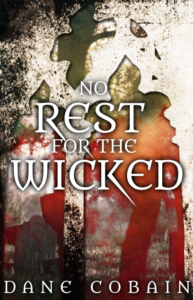 The following is a guest post by Dane Cobain, author of No Rest For the Wicked. A signed book is a special thing – it’s imbued with the spirit of its author, and it can remind you of where you were and what you were doing when you first got hold of it. At other times, you pick up a signed book second hand, and you’re left to wonder how it came to be signed, and who it was signed for. Today, I’m here to talk to you about some of the signed books that I own. I have almost 1,000 books in my collection, on bookcases that span two rooms, so there are plenty of signed books to choose from! Let’s get started. Patience Agbabi – Transformatrix: Transformatrix is a book of poetry, and I bought it from Patience when she came to do a talk at my old university; I’ve recently discovered that a friend of mine performed on the same line-up as her at a poetry night in the 80s. Allie Burke – Paper Souls: Allie is one of my fellow authors at Booktrope, and Paper Souls was the first of her books that I read. I’ve read a couple more since then, but Paper Souls is still my favourite, and one of her best-known works. Jesse James Freeman – Billy Purgatory: I am the Devil Bird: Jesse used to be VP of Community Management at Booktrope, and Allie introduced me to him. He was good enough to send me a signed copy of his book to read, as well as a couple more to give away to the readers of my book blog, Social Bookshelves. Rob Grant – Fat: Rob Grant used to be in a writing partnership with Doug Naylor, and the two of them wrote the script for Red Dwarf, a cult sci-fi comedy that I used to be crazy about. My dad picked this up, a signed copy of one of Rob Grant’s novels, from Forbidden Planet as a birthday present. Michael-Israel Jarvis – Gravedigger: Mr. Jarvis is also a Booktrope author, but this time, it works the other way. After I got signed to Booktrope, I suggested to Izzy that he ought to submit some of his work, too. A year or so later and I’m his book manager, and we’re gearing up to release his second book through Booktrope. Liz Riley Jones – Hiraeth Trilogy: I felt like I ought to mention the whole trilogy here, because two of the three books are signed and all three books were sent to me by their author. It’s a sign of how good they are that I read the first book, then happily accepted the second and the third books too. It’s pretty rare for a contemporary author to keep me hooked for that long. Mike Pender – The Search for Myself: Mike is one of the founding members of The Searchers, a group that went down in rock ‘n’ roll history. You might not think you know them, but you’d recognize some of their songs. The Search for Myself is Mike’s autobiography – a riveting read. Julia Suzuki – Yoshiko and the Gift of Charms: Julia is a former client of mine – I used to work on her social media team when I was at Sociabull, before moving to fst. This is the first book in her quirky series – it’s aimed somewhere between a children’s book and a YA book, and I enjoyed it as an adult. James Val’Rose – Path of the Gods: This is another book that the author sent to me – I discovered James because he was on an episode of Come Dine with Me and my girlfriend at the time said I ought to contact him. He ended up sending me his fantasy novel, which I’m grateful for! Benjamin Zephaniah – Talking Turkeys: I was given this book for free! I picked it up when I went to visit The Book Barge – it was in the bargain bucket anyway, but Sarah, the shopkeeper, let me have it for free because I was buying a bunch of other books, too! So there you have it – that’s (most of) my collection of signed books. Let me know which signed books you own in the comments, or tell me which one of mine you’d prefer to get your hands on. I’ll see you soon! More about the author and his work: Dane Cobain’s website. Dane Cobain is a writer, poet and musician from a place you've probably never heard of, somewhere in England. When he's not writing books, he's reading and reviewing them on his book blog - SocialBookshelves.com - or working at his day job in social media marketing.